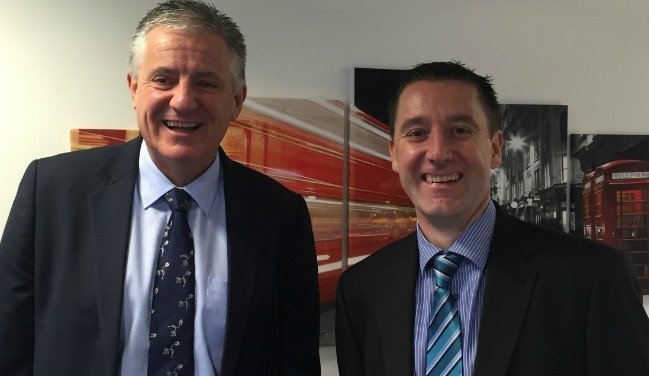 Guy Wadsworth, Mistral Asset Finance’s Chief Operating Officer (left) with new appointment John Green, Regional Sales Manager. A new addition to the Mistral team is expected to have an immediate impact on the company’s operations in the East where Mistral has recognised an opportunity for growth. Mistral Group is pleased to announce it has appointed John Green as Regional Sales Manager. John will be based in Anston, South Yorkshire. John is new to the industry, having previously carved a successful 24-year career in overnight parcel and logistic distribution. He spent 19 years with one company and five-and-a-half years at a second business prior to joining Mistral. “I was looking to get out of that market,” he said. “I took my time and looked at a few industries and it was the bus and coach industry that ticked all the right boxes for me. “I’m now responsible for a bigger patch. This is a growing company and that’s exactly what I wanted. Guy Wadsworth, Mistral Asset Finance’s Chief Operating Officer, said John’s experience in sales and building customer relationships made him the stand out applicant. “John has certainly proved himself in a tough industry in his previous employment,” he said. “He sees himself very much as a customer-facing, proactive person which are exactly the attributes we were looking for,” he said. John describes himself as a family man who is keen on football and fitness. He and his partner have three children between them. To contact John or to welcome him to the Mistral team, email john@mistral-group.com or phone 07800 999 552.